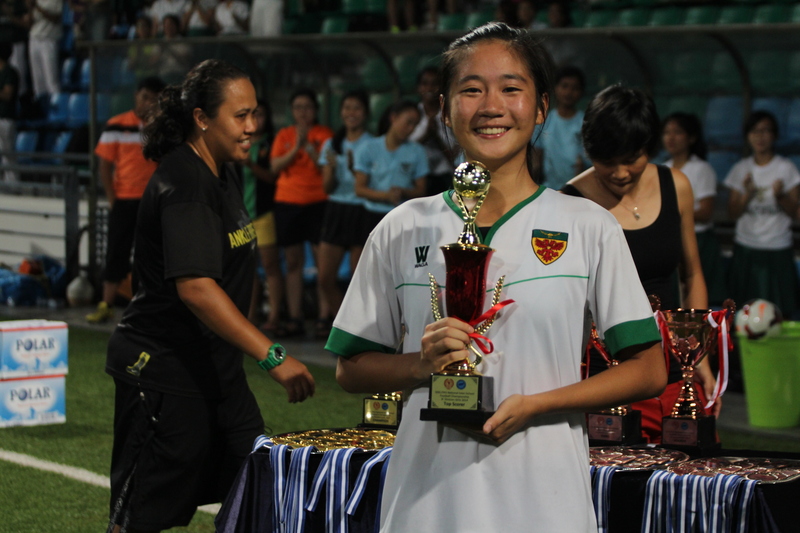 Last year, the Raffles Soccer Girls clinched the bronze medal with a goal in extra time to seal a 1-0 victory. This year, extra time proved the curse for them as they fought to be champions for just the second time against VJC at the Jalan Besar Stadium. Beset by cramps and fatigue as the game headed into extra time, our soccer girls unfortunately fell to VJC 1-0 with the last kick of the game. It was never going to be an easy game, with RI having to battle a team which was technically drilled and more experienced, with VJC having contested 8 finals in the last 9 years and winning 7 A Division titles so far. The game started at a sanguine pace as 200 odd Rafflesian supporters converged upon the stadium, cheering the team on. Within eight minutes, however, the first shot had already been taken, with VJC sending a shot off target and a free kick from RI’s #6 Jane Ong being saved comfortably by the VJC goalkeeper. The first real chance of the game was not long to come, however, with captain Liza Tay (#13) chipping the VJC goalkeeper which beat the keeper but also beat the post. Both teams then started creating chances, with the VJC team coming close on a few occasions with dangerous cross-shots and set-pieces, but most of them came to naught. Our team sat back for most of the first half, defending deeply to combat the skilful and technically gifted VJC team. With two minutes to go in the first half, the game suddenly sparked into life, with a brilliant ball from Jane sending Louise Lee (#3) clear of the VJC defence. Alas, the offside flag was raised as the RI fans rose to their feet, although Louise hit the post anyway. The second half started at the same frenetic pace which the first ended in, with VJC taking a long range shot just a minute after the game restarted. This would prove to be a recurring tactic over the course of the rest of the game, with the VJC team alternating between struggling to break down our stubborn defence and shooting from long range. In the 50th minute, this tactic nearly succeeded, with a long-range shot from a VJC player nearly creeping into the goal before a timely intervention from Jane on the line. The game started to become increasingly exciting, with end-to-end football as both teams sought to score the winner before extra time. In the 55th minute, drama ensued as another long-range shot from VJC crashed against the crossbar. Within seconds, however, RI swept forward in a rapid counter-attack which featured Jane going on a stunning Gareth Bale-esque run from her own half to dribble past five or six defenders. Alas, her shot also thundered against the crossbar before being cleared for a corner. The match then headed for extra time as the score remained 0-0. Even amidst the tension of the game, the VJC captain still had the heart to help #6 Elizabeth Jane Ong stretch her cramped leg. Plaudits to her! Extra time proved increasingly difficult for the Raffles team as cramps and injuries started to set in, with our brave team even playing with only nine players at one point because of the cramps. 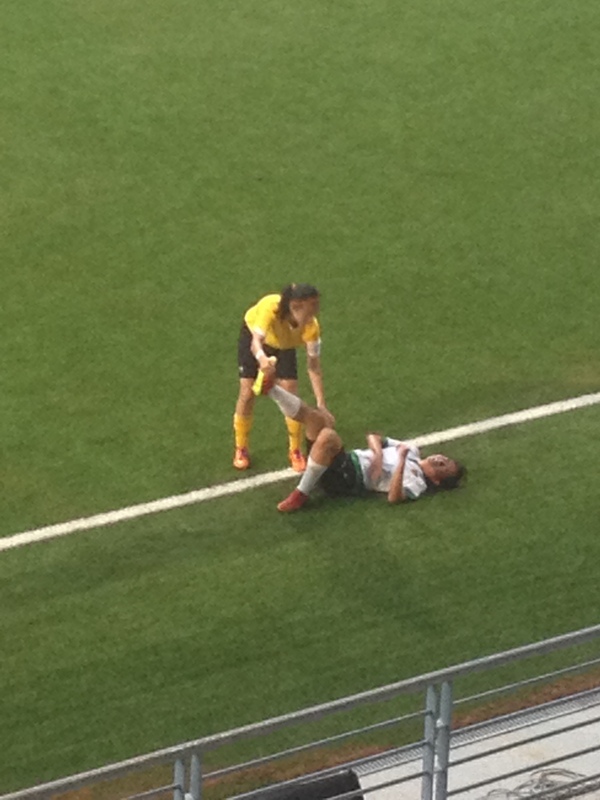 Yet, despite the tense nature of the final, there was still room for sportsmanship as the VJC captain helped to stretch Jane’s leg after she succumbed to muscle cramps on the field. This sportsmanship continued, with both teams doing their best to keep playing good football. It seemed as if the game would end with a penalty shootout, with neither team edging the other in a close game and the clock ticking down to the end of extra time. Yet, there was still enough time for a final twist; with seconds remaining in injury time (the time added to compensate for time lost in dealing with injuries) VJC won a free kick just outside the box following a foul to stop a mounting VJ attack. From the resulting set piece, the ball was stabbed home by a VJC player, who wheeled away to celebrate as our players crumpled to the floor in defeat. In the final minute of extra time with virtually the last kick of the game, our stubborn resistance had been broken by the more technically accomplished VJC players. The never-say-die attitude of the team continued, with Liza (#13) attempting to charge forward from kickoff to grab a goal back. Alas, it was too late for our courageous players who fought to the very end despite having all odds stacked against them. When asked about her thoughts on the game, soccer girls captain Liza said: “It was heartbreaking, we’ve worked so hard throughout the year and to come short in the last few seconds of the game was really hard to take. But we left the field with no regrets cause we really put everything we had on the line.” Coach Mr Sulaiman agreed, saying: “Both teams played very good football. Beautiful football. 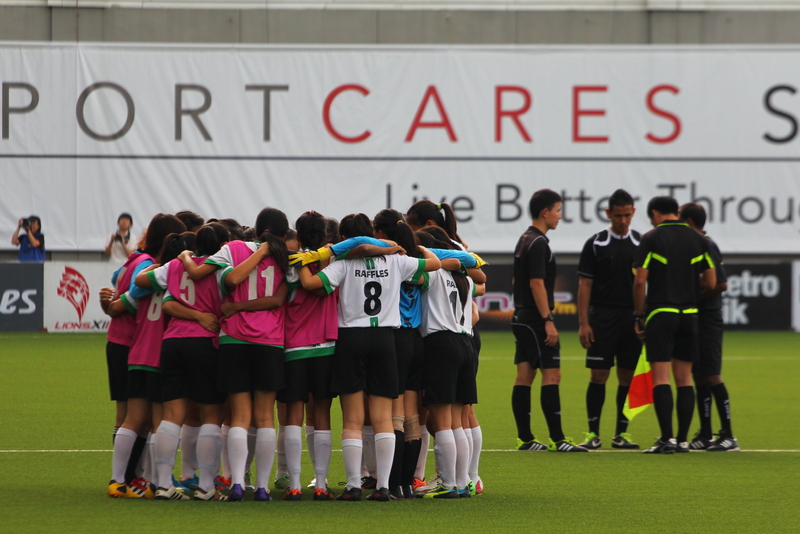 The team performed awesomely and this is a bunch of beautiful girls.” Spectator Ryan Lim from 15S03E was similarly enthralled: “I thought it was a very intense game, we fought our hearts out but unfortunately we lost at the last minute. I felt that I’m very proud of the team and what they have achieved throughout the season.” Our team truly put in their all, coming close to winning several times in the game despite their more experienced opponents. 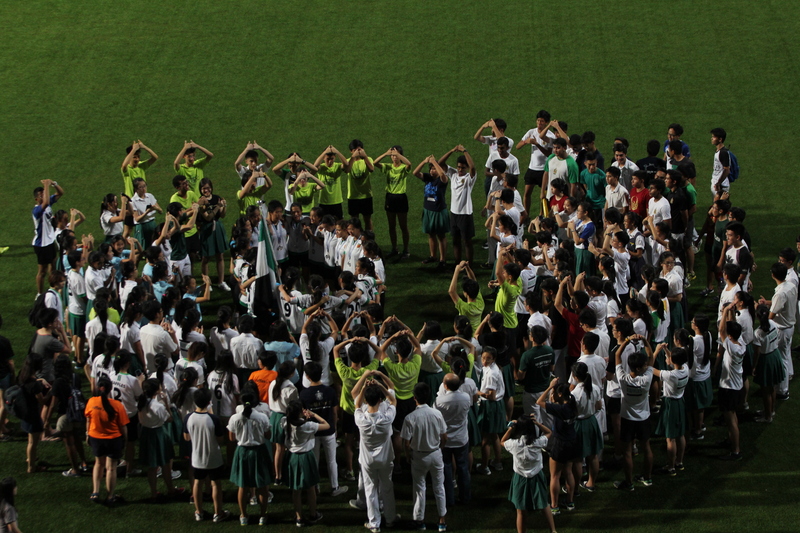 The soccer girls this year may not have won the title, but they definitely showed us how Rafflesians can unite together to fight through the sun, and through the rain. Even though they might not have lifted the trophy at the end of the day, the soccer girls truly won the hearts of their spectators that day.